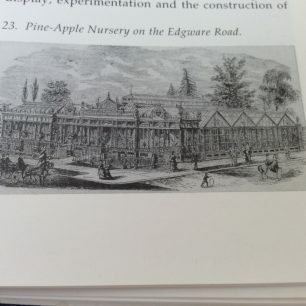 The illustration at the top of this entry and the website is Ben George’s lithograph of Henderson’s Nursery or Horticultural Establishment in Wellington Road around 1857. The building of St John’s Wood coincided with a huge upsurge of interest in gardening. This may have been due to the impact of the landscape gardener, John Claudius Loudon ((1783-1843), publisher of the first popular gardening magazine, and inventor of the curved glazing-bar which made it possible to design elegant greenhouses. Edward George Henderson (1783-1876) was a nurseryman at Vine Place, Edgware Road and a member of the family firm which owned the Wellington Road Nurseries and Pineapple Place. Gardener Eli Cook had taken over Wellington Nursery, John Gibbs’s original ground in 1831. Gibbs had operated at various sites in St Johns Wood since at least 1817 and grew cauliflowers, cabbages, peas, strawberries and fruit trees but by the 1840s a new type of nursery developed, geared to supplying ornamental planting. The Wellington Nursery was then taken over by Andrew Henderson (1823-1906). 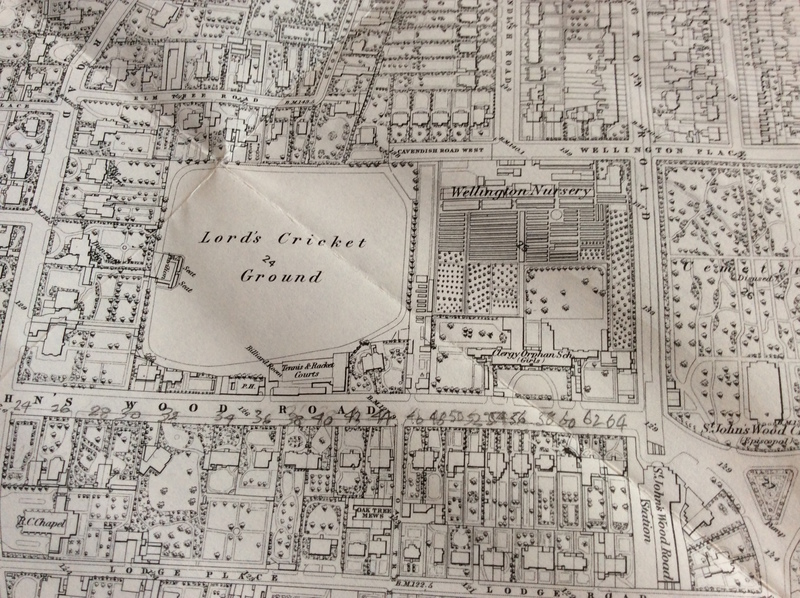 The site was acquired by Lord’s in 1887 when it was bought from the Clergy Orphan School as a practice ground, and is still today known as the ‘Nursery End’. 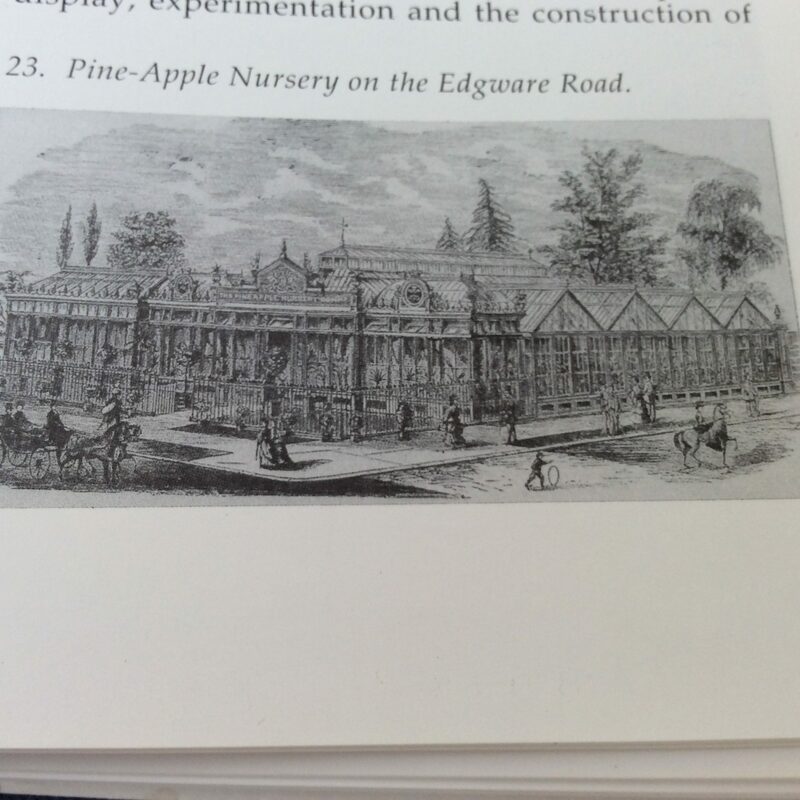 Henderson’s Pineapple Nursery was on Pineapple Place which was on the corner of Hall Place (now Road) and the Edgware Road. It has been described as being one of the great Victorian nurseries. Their object was to cultivate whatever was ornamental and of rapid growth, eg large quantities of free-flowering geraniums. At Pineapple Place they developed a double-white variety of the Chinese primrose. According to the Floriculture Magazine in 1839, “…..the extensive and excellent establishments of Messrs Henderson at Pineapple Place and the Wellington Nurseries ….their object is to cultivate whatever is ornamental and of rapid growth…..in the Wellington Nursery large quantities of free-flowering geraniums. At Pineapple Place, a double-white variety of the Chinese primrose. 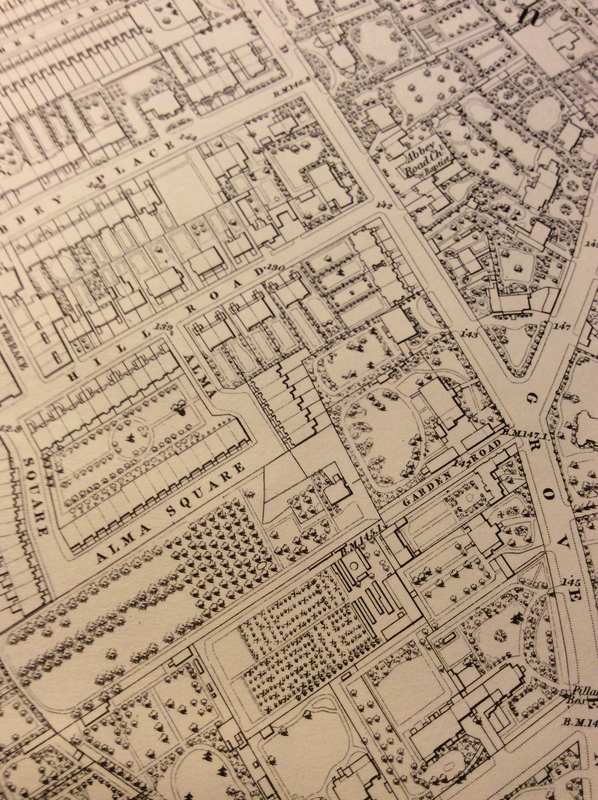 Around 1818 James Gulley was established in Garden Road. Garden Road marks a site with a long history of commercial gardening. 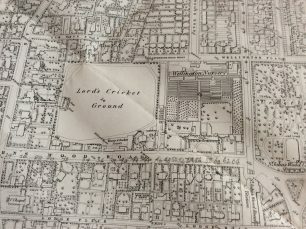 The nurseries sited at the far end of the road are visible on the 1868 Ordnance Survey map. There were two nurseries side by side – that of James Gulley and the other of James Whitton. Flower shows became a perennial feature of St John’s Wood life and as early as 1835 a flower fete was held at Lord’s in honour of teenage Princess Victoria, the queen-in-waiting. A gala event at the Pineapple Place nursery in 1877 contributed to the costs of the enlargement of the chancel at St Mark’s. Hamilton Terrace. 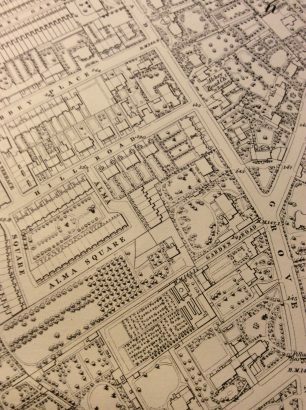 Acknowledgements to Mireille Galinou’s Cottages and Villas – the Birth of the Garden Suburb, and to Richard Thames’ St John’s Wood and Maida Vale Past. Very interesting to read. My Great great grandfather John Murray Henry worked for Henderson nursery’s in 1866 before taking a post in India. Lovely article Jeanne. I can hardly bear to look at our patio in South Africa and others too, with no water to irrigate, and even the shrubs dying at the moment. Your research on SJW and article are excellent.